We’re proper into Autumn now – the nights are drawing in and it’s getting trickier to find dry spots to skate. No worries! Here’s another skater bio for you to enjoy. This week I’ve been speaking to 21-year old Rianne Evans, who I only noticed ripping it up this summer but has had mad skills for quite a while. You may have seen her at the Unicorn Girls Jam. Hey Rianne! Tell me a bit about yourself – is skateboarding what you do for a living? I’ve been working for Tesco for the past 3 years because it’s easy and reasonable pay for what it is. I’ve just started Brighton Uni studying Earth and Ocean Science, I hope to get into marine conservation further down the line. I just don’t want to end up with a desk job with the same environment every day. I’ve had desk jobs for the last 8 years – it just makes getting out there all the sweeter! So have you always lived in Brighton? No – I’ve only been here 2 weeks, it seems pretty hectic!,The skateparks pretty quirky and so busy everyday! I’m originally from Bournemouth though which is rad! The skate scene there’s really good, it’s well chilled, everyone gets along and we often have fun skate events like Queen of Kings where all the boys dressed up in drag. I pretty much grew up at Kings skatepark, it’s home. Dressing up in drag is pretty fun. What was the hardest thing about getting into skateboarding? For me it was definitely worrying what other people thought, when I first started I would get down the skatepark super early in the morning to skate when the park was quiet. When you make friends with everyone at the skatepark thought it becomes a lot easier and people are always really supportive! What other stuff are you into? I pretty much skate every day I can, It’s probably my only real hobby. It’s hard enough to find time for skating sometimes with work, uni and friends… I don’t think I could handle anything else, I enjoy my sleep too much. Spoken like a true veteran…so what’s your skateboarding story? I started skating about 6 years ago when I was 14 because two girls I was friends with started skating and I thought I would jump on the bandwagon, they didn’t stick with it though which is a shame. I really loved skating for the first 2 to 3 years then I sort of couldn’t be bothered with it and only went down the park every few months to prove to myself I could still do it. I think the skate scene sort of died because of people moving to university and away in general, hardly anyone would go down the skatepark, which sort of made skating pretty boring. I got really back into it again this year though, the scene down the parks is definitely getting bigger again, new generation and all that. I’m glad I’m back to skating everyday I can now it, I don’t know how I could have gone months without it now. Do you skate with other people then? Back home in Bournemouth I just skate with whoever is at the park and go on trips to other parks nearby with whoever’s going. My friend Geordie has been real good to me always taking me places to skate and sorting me out in general. I like to skate with the girls when I can too but that usually involves travelling to girl skate events. Too right! And what’s your favourite place to goofy-foot it? Probably Kings park my local in Bournemouth, although it’s boring because I’ve skated it for so long it’s home. I like Mile End in London, Swalecliffe in Kent and Taunton in Somerset they’re all fun parks. Yes – I can vouch for Taunton, my hometown. Where would you love to skate anywhere in the world? Probably America, somewhere like California because I’ve heard it’s amazing or Australia, anywhere with a good scene, sick parks and nice weather to be honest. Because I skate a lot of ramp my favourite trick to watch is 5.0 fakies, I once had a dream I could do them and I was so happy until I woke up. I can only do stalls on a 2ft (sometimes), it will take me ages to learn them on a proper ramp and even longer to grind them… I just don’t understand that trick! What does skateboarding mean for you? I think the social side of skateboarding has always been the best bit about it for me, there’s such a huge community but at the same time it’s so small you’re always meeting someone that will know a friend of yours even from across the globe. It’s also just a good way to clear your head and take time away from the real world. The self-achievement you get form learning new tricks is good too. It’s really nice to land something that you’ve been trying for a long time. And finally, what advice would you give to fellow skateboarders? To people starting up I would say just stick it at it everyone was in the same position when they started, no one was good straight away. You have to skate for yourself, don’t listen to negative people and don’t let people get you down. 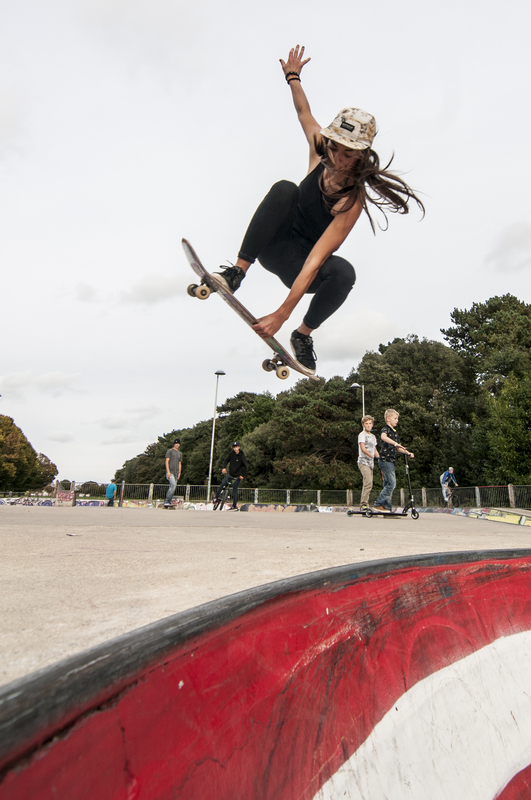 ← ROM SKATEPARK GIVEN PROTECTED HERITAGE STATUS – FIRST IN EUROPE!